This is a simple explanation of how to use a triac and opto isolator to switch AC voltages on and off to a device (load). The opto isolator is used to give a physical separation between the low voltage and the high voltage circuits. The Arduino is optional. You can substitute the signal coming from the Arduino with any 5 volt DC signal voltage. This cannot be used for dimming lights. The opto isolator I used is a M0c3041. Take notice that in the schematic the opto isolator has a triac and not just a switching transistor. This is essential piece. It allows current to flow in both directions when the opto isolator is switched on. Please feel free to ask questions. How to properly detach/turn off a servo with arduino. Lets say that you have a project that uses a servo and runs on battery. Currently there is no way in code to turn off an analog servo. Some say to use the detach command. This doesn’t work. Analog servos aren’t designed to be powered and not have a pulse being sent to them. So, what happens when you use the detach command with an analog servo? When you do servo.detach(); you turn off the 5 volt pulses that control the servos position. When an analog servo looses pwm signal it will hold a position. The position held will vary from servo to servo. So, what we have is a servo constantly drawing power from our precious limited power source. So, what can we do to mitigate this annoying issue? 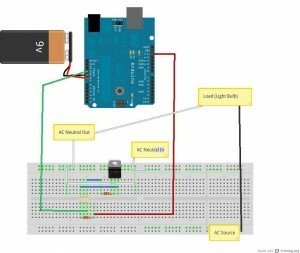 servo.detach(); //stop sending pulses to reserve power on the Arduino. Now for the hardware. In order to completely turn off the servo so that it isn’t drawing unnecessarily on the battery, we need to use a general purpose NPN switching transistor. I used a 2N4401. From the Arduino: Pin 7 goes to the base of the transistor. From the transistor emitter: To the power pin of the servo. From 5 volts: to the collector of the transistor. From servo ground pin to ground. What we have done is set a pin in code as an output (tranPin) that we activate right before we tell the servo what to do. This turns the power on to the power pin of the servo. Then when our servo has finished the job set in loop we set the tranPin low. That turns power to the servo back off. Please comment with questions of head over to our forum to have a discussion.